Perhaps you may have heard the names like the series regulator, 3-terminal regulator, dropper, or LDO. All of these refer to the linear regulator. 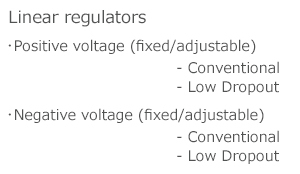 Aside from these names, linear regulators can be classified into several categories by function, or the scheme by which they operate. First of all, linear regulators can be divided into positive voltage and negative voltage regulators. Incidentally, there is not much variation among the negative-voltage regulators. On the next level, linear regulators can be divided into fixed output and adjustable output regulators. The fixed type, as represented by part number of the 78xx (positive) and the 79xx (negative) , is a 3-terminal type consisting of input, output, and GND terminals. Because output voltage level setup resistors are integrated into the IC, the feedback pin does not need to exist externally. In the adjustable type, if it is a GND reference type as illustrated in Figure 1, the feedback pin is provided externally, making it a 4-terminal. The adjustable type also includes floating operation of the 317 (positive) and the 337 (negative) which have no GND pin, making them 3-terminal. One level up from the fixed and adjustable types is divided into conventional type and low dropout (LDO) type. An abbreviation of “Low Dropout”, the “LDO” type is a modification to 1V or less of a conventional dropout voltage (the minimum input-output voltage difference to enable regulated operation) of approximately 3V. When 3.3V ICs began to appear in the marketplace, the LDO type gained currency. In old days when most regulators required a conversion from 12V to 5V, the conventional dropout voltage of 3V did not present any problems. However, when a need for 3.3V power supply arose, it turned out that generating 3.3V from 5V was not possible, and this led to the development of LDOs. While all of the linear regulators mentioned above are of built-in output transistor type, there are also ICs called linear regulator controllers to which external output transistors are attached in order to handle a large current. In addition, based on fabrication process features, they can be grouped. Generally, bipolar process linear regulators are mostly high-voltage tolerant regulators featuring, e.g. 35V or 50V. In these regulators however, current consumption tends to be large, measuring several mA. 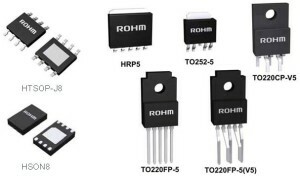 Whereas recently CMOS regulators featuring a high voltage capability of 20V have hit the market, most such regulators are based on an input voltage assumption up to 5V. In those devices, the current consumption is extremely small, amounting to dozens of µA. In terms of packaging, because thermal dissipation is critical to linear regulators, low-thermal-resistance packages are used. As the through-hole type, the TO-220 type packages endowed with a heat sink are used, and as the surface-mounting type, the packages with thermal dissipation pads exposed on the backside are employed. ・There are positive and negative voltage linear regulators, which are divided into fixed- and adjustable-output types. ・The LDO type, characterized by a low dropout voltage between its input and output, is a product designed to meet the requirements for lower supply voltages. ・In terms of packaging, through-hole types equipped with a heat sink for heat dissipation are still quite popular.